Confidence among Wellington region businesses has bounced back after a significant decline post-election, with local companies more enthusiastic about future market prospects. According to Wellington Chamber of Commerce findings, confidence in the local and national economy, businesses’ own situations, earnings forecasts, and intentions to hire staff have all increased in the latest quarter. However, that confidence is still well below the level at this time last year. Conducted over a two-week period in March, a net 21 per cent of business respondents expect the Wellington economy to improve over the next 12 months - an increase from a net positive 16 per cent in the previous survey in December. In March last year a net 52 per cent responded positively to the same question. Meanwhile, confidence in the national economy has improved significantly, with a net positive seven per cent expecting improvement, compared with a net negative 14 per cent in December. That result was the first time since January 2009 that net sentiment in the national economy had been negative, and followed the change in government and signals of changes in government policy. “It’s great that many of the main confidence indicators are improving, though there is a long way to go to get back to the levels of last year,” Chamber of Commerce CEO John Milford said. “With the Government three months older, we were hoping business would have a clearer idea of policy intentions, but it seems there remains a lot cautiousness out there. Delving deeper, businesses’ confidence in their own situation rose slightly in the latest survey, with a net positive 46 per cent expecting an improvement over the next 12 months, compared to 43 per cent in December, and 61 per cent at the same time last year. "What is positive is that businesses’ expectations of what they can control - the day-to-day success of their own business - remains steady at 46 per cent net positive,” Milford added. "These results are an improvement on the last quarter, but it’s clear the coalition Government still has some way to go to fully restore business expectations. The impact of recent policy announcements, such as changes to employment laws and petrol tax changes, are yet to be fully realised." Earnings expectations also rose slightly, with a net 44 per cent of businesses expecting them to increase, compared to 41 per cent - this was well below the 61 per cent in June and 57 per cent in March last year. Of all respondents to the latest survey, 57 per cent expect an improvement, while 13 per cent expect earnings to decline. From a partner perspective, intentions to hire staff, however, increased. When asked what changes they expect to staffing numbers over the next three months, a net 24 per cent said they expect to be looking for more staff, up from 20 per cent in December. Finding skilled staff continues to be a challenge for most businesses, with a net of just four per cent saying it’s easier than it was 12 months ago, compared to seven per cent in December - some 41 per cent say it’s harder to find skilled staff. When asked unprompted what barriers are holding back their business, the main issue cited was an inability to access or attract skilled staff (31 per cent of respondents), which is consistent with Chamber surveys over the past year. 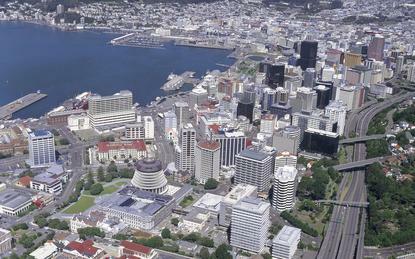 When asked unprompted what barriers or issues they believed were holding back the Wellington economy, the most common issue cited was Wellington’s infrastructure, including the road network, airport runway, rail system, and internet connection speed (44 per cent). This was followed by local government direction and leadership (18 per cent), and central government direction and policy (17 per cent).